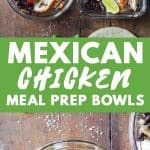 The most delicious Mexican Chicken made into Meal Prep Bowls that you can take as lunch to work. 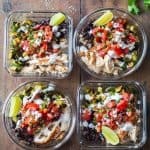 Mexican Chicken recipes are all awesome for meal prep. If you’ve been following along for a while you know I’m a meal prep fanatic and recently I’ve been digging these Greek Chicken and Maple Dijon Chicken lunches for my weekly lunches. I do so much better sticking to my healthy eating goals when I meal prep. You look forward to your lunches, you have them sitting right there in the fridge. 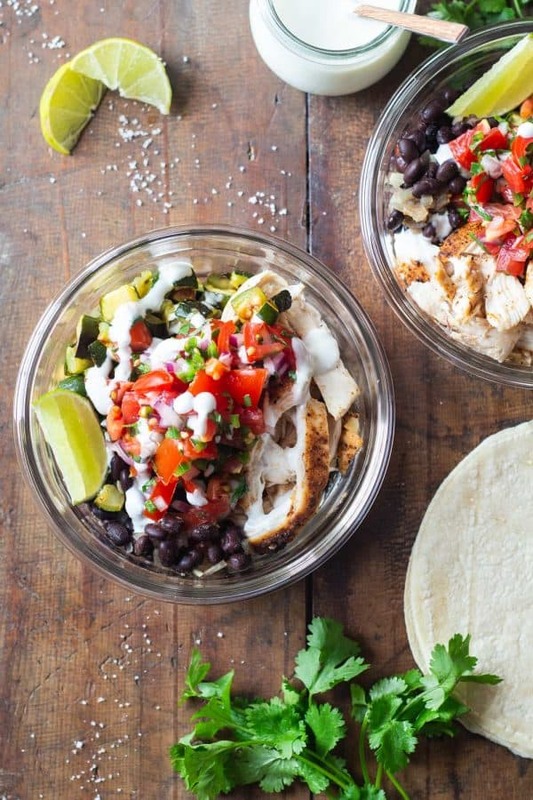 How likely do you think you are to eat junk or nothing at all if you’ve got delicious Mexican Chicken Meal Prep Bowls waiting for you? There is not only ONE way to season Mexican Chicken of course. There is more like 96847393 ways to season it. The #1 and most important ingredient though that is probably in ANY recipe on the internet: chili. Again, there are 86950760 different chilis and chili powders, one of my favorite and the one I’m using in MY Mexican Chicken recipe is “chipotle chili powder”. Cumin and coriander taste amazing in combination with the chipotle chili and the sugar and salt complement the strong spices amazingly! Basically, what it all comes down to in Mexican cuisine is: don’t shy away from spices and chili. Simple as that. And that’s what we’re doing today for our meal prep bowls. I love using zucchini, black beans and pico de gallo. Zucchini cooks super fast so we can roast it together with the Mexican chicken on the same baking sheet. The black beans scream Mexican and they give us our necessary carbs (if you eat carbs, otherwise, just omit). The pico de gallo gives the dish a super nice “fresh” flavor. The juicy tomatoes mixed with lime and crunchy red onion are the bomb on these meal prep bowls. It’s super simple to bake chicken breasts. You want to bake them for a short amount of time on high heat. Chicken breasts are the juciest when you bake them either at 450F or at least 400F. You always have to decie on the temperature depending on if you have more things in the oven baking or roasting at the same time. When I bake chicken breasts along I bake them at 450F. In this case we are roasting some zucchini at the same time and at 450F we risk they burn. Choose 400F and chicken breasts no larger than 11 oz (300g) and you’re golden. Add sugar, coriander, cumin, chipotle chili and sea salt to a small bowl and whisk. Sprinkle spice mix generously on both sides of both chicken breasts and add the rest of the spice mix to an oven-proof bowl or baking dish. Add cooked black beans, chopped yellow onion, garlic and chicken broth to the bowl and place on a large baking sheet. Add chicken breasts to the baking sheet and then wash, dry and dice zucchini and add to a bowl. Sprinkle zucchini with sea salt and drizzle with avocado oil and then mix with your hands until all pieces are well coated. Spread the diced zucchini out on the baking sheet and then place everything together in the oven for 20-25 minutes or until the chicken reaches an internal temperature of 165F. 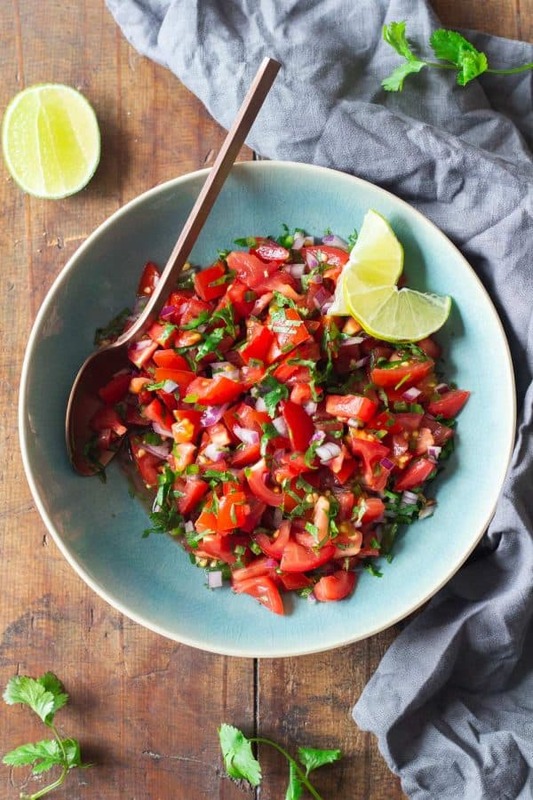 In the meantime, prepare the pico de gallo: Add tomatoes, red onion, jalapeño, cilantro, juice of half a lime and a pinch of sea salt to a bowl and toss until well combined. Remove everything from the oven and let the chicken rest for 5-10 minutes. Then use two forks to shred it and then divide it amongst 4 meal prep containers. 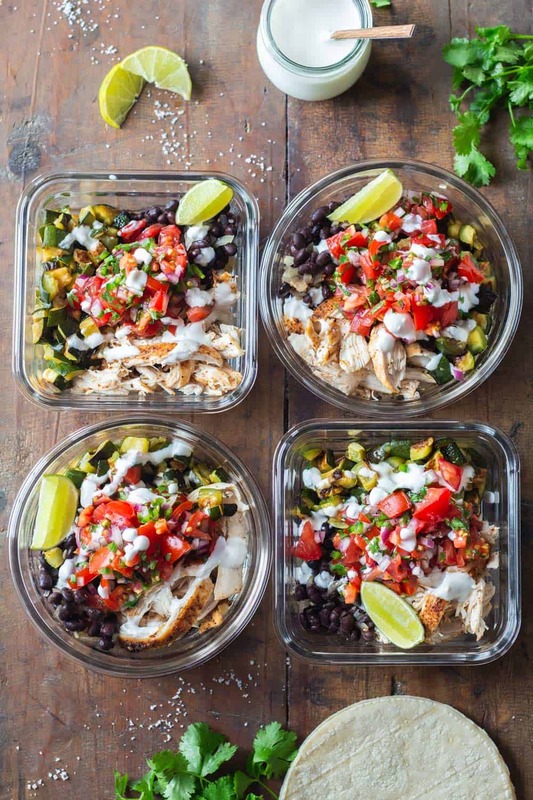 Divide zucchini and beans amongst the meal prep containers, too, top everything with pico de gallo, drizzle with some sour cream and store in the fridge for up to 4 days. (I drained the broth of the beans a little to make it less soupy and I added a little bit of water to the sour cream to make it more drizzable).